Also available for free on Eisler’s web site. If you’re an indie author, you likely know about Barry Eisler and Joe Konrath. Eisler is famous (in the publishing world, anyway) for having turned down a half-million-dollar contract with St. Martin’s in 2011 in favor of self-publishing. Konrath is the granddaddy of self-publishing. Reading his blog, A Newbie’s Guide to Publishing, from Day 1 to the present is highly recommended for anyone thinking of going indie. That’s what I did, and it convinced me to ignore traditional publishing from the get-go. You can make a living as a writer of genre fiction, but man, it’s a helluva lotta work. Here are all the things I’ve done to become moderately successful. I thought of a fun experiment: I’ve been giving away all these old publisher-rejected novels for free on my web site. I’m going to put them up on Amazon as ebooks and see what happens. What do you know … people are buying them. Shows you how much the publishers know! Still, if you’re just starting out, I recommend trying to get a deal with a publisher. Holy cow, people are really buying those ebooks. Suddenly everyone is more interested in my work and my ideas. You should think pretty carefully before accepting a traditional publishing deal. Wait a minute, here. I’m making hundreds of thousands of dollars as an indie author, and I have complete control over my product and marketing. Screw traditional publishing. That summary of seven years’ worth of posts obviously paints in wildly broad strokes, but I think it catches the general gist of things. It’s a fascinating and extremely informative read. So, if you’re interested in indie publishing, hearing Eisler and Konrath chew the fat is not to be missed. And the book doesn’t disappoint, so long as you go into it expecting it to be what it claims to be — a “conversation,” not a carefully structured, thesis-driven argument. The book is a compilation of three conversations Eisler and Konrath carried on electronically using Google Docs. Each conversation covers wide ground. In general, the first treats the traditional-publishing vs. self-publishing issue broadly; the second takes on various counterarguments generated by the first; and the third focuses largely on Eisler’s decision to publish a book with Thomas & Mercer, Amazon’s thriller/mystery imprint. Each conversation is interesting and enjoyable in its own right. Rather than trying to cover everything, I’ll just mention a couple items I found particularly arresting. Eisler and Konrath do a lot this sort of thing in the book — rebutting counterarguments and tracking down fallacies. They’re terrific at finding the problems in others’ reasoning. For instance, a $500K advance sounds like a lot, but digital is forever, whereas many print books only get a few years on the shelves, then fall out of print. What if your ebook sells well for thirty years, and you make a 70% royalty on every sale? Does $500K sound like so much, in comparison? And why is it that the New York Times bestseller list doesn’t include indie books? And why do people think that piracy cuts into sales so much, as though every person who pirated a book would buy that same book if she weren’t able to pirate it, rather than just stealing something else? Basically, the pro-traditional-publishing crowd puts a lot of waist-high fastballs over the center of the plate, and Eisler and Konrath have a great time stepping up for BP. I’ll mention one other point: Eisler and Konrath devote some time to the idea of agents becoming “estributors” (Kindle location 1880). There’s a market, they point out, for someone who will charge a smallish percentage of a book’s profits — say, 15% — in order to take care of editing, formatting, cover design, uploading, and so forth. And fielding those offers for film rights, right? For what it’s worth, I think they’re right, and I bet their prediction of how agents’ roles will change is on target. Unlike the big publishing houses, agents aren’t weighed down with the vast apparatus of paper-book production. Those who are flexible and far-sighted can adapt to an increasingly indie publishing world. I have just one bone to pick with Eisler and Konrath. The two of them clearly have a great rapport, and they’re really funny. But the book’s title, Be the Monkey, actually strikes me as misleading. The title’s drawn from a series of YouTube videos that show monkeys knowing frogs in the biblical sense, which Eisler and Konrath find hilarious. Now, my sense of humor is, I believe, every bit as sophomoric as these guys’, so I don’t object to the frog-molestation jokes on moral grounds. 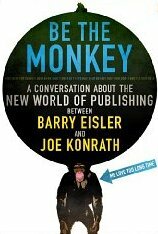 But Eisler and Konrath’s point (if someone has to be the frog and someone has to be the monkey, make damn sure you’re the monkey) doesn’t get at the genius of the indie-publishing movement, which is that no one has to be the frog, and no one has to be the monkey. Indie publishing is a win-win for readers and authors: readers pay less while authors make more and have greater control. Admittedly, it’s not a win for the big publishing houses, but as Eisler and Konrath point out, those companies are actively monkeying it up by overpricing ebooks to support the flagging paper market. That means they probably don’t deserve to win. An edited version of this review will be cross-posted on Amazon.